[By Nick, New for 2013] I’ve already spoke about my love for the Heath Klondike bar so I was more than excited to try out the Cadbury English Toffee bars that Wells sent me and see how they stack up. I really enjoyed the original Cadbury bars Blue Bunny put out last year so I’m hoping to continue that trend. 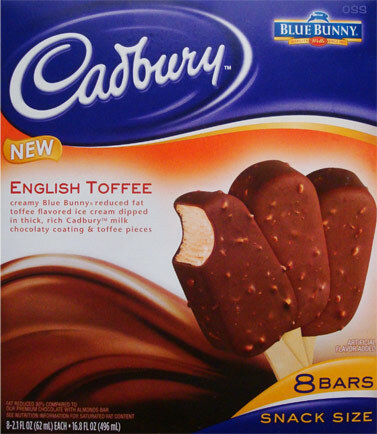 Described as “Creamy Blue Bunny reduced fat toffee flavored ice cream dipped in thick, rich Cadbury milk chocolaty coating and toffee pieces” this one sounds very enticing to me. Companies really need to use toffee a lot more. If I see toffee in the name of a product, the chances of me picking it up increase by 50%. These wrappers make me feel fancy. Out of the wrapper, the bar looks exactly like their chocolate almond sibling. Even when I cut a little of the top off to get a cross section it still looks very similar to the almond bar. 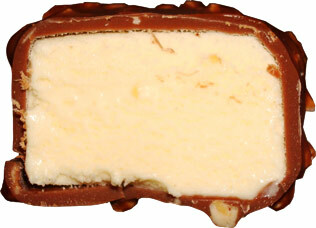 There’s a slight yellowish hue but not one that screams toffee like the Heath Klondike bar. Seeing as I’m going to compare this to the Heath Klondike version let’s start with the shell. In one word, this shell is superior. Actually there’s no contest, the Cadbury milk chocolate mixed with toffee pieces is remarkable. I know this might sound stupid, but does Cadbury make a toffee bar by any chance? Where the Klondike shell is thin, this one is thick and way more satisfying. I love crunch and this one sure delivers. The thickness leads to it being very structurally sound. When bit into, it only seemed to crack around where I was biting and not into big pieces like the Klondike tends to do. Blue Bunny easily wins the shell competition. Okay with that out of the way, time to move onto the ice cream. This part is pretty much a tossup between the two. The ice cream alone is eerily similar between the two. The taste isn’t all that different though Blue Bunny’s texture seems to be a bit denser and creamier which makes sense seeing as Klondike uses a lower fat ice cream. The main difference is when eating this as a whole you can taste the toffee ice cream a lot more in the Klondike version. I’m pretty sure that’s mainly due to the thinner shell to not compete all that much with the ice cream. Still, the shell on these bars is just so amazing I don’t mind the lower intensity of toffee flavor. Heck, I can just eat the shell and then the ice cream or vice versa. My only gripe is the same one I have with all of these Cadbury bars, they’re way too tiny! The Heath Klondike bar is filling on its own. I feel like I’d need to have a couple of these to truly be completely content. Blue Bunny, can we just amp the size of these already? Magnum now makes minis so it’s only natural that you guys create a bigger bar! Buy Again? It might end up taking the Klondike’s spot in my freezer more often than not. I agree there's something amazing with their shells. Even the Rich Dark ones are remarkable in that way. Hey this could've been a Friday night fight! Nick, Cadbury does not make a toffee candy bar, but after eating Ben and Jerry's Vanilla Heath Crunch for the first time a couple of years ago, I can definitely understand your love for toffee candy in ice cream! You or Dubba should definitely do a review of Ben and Jerry's Vanilla Heath Crunch because it's an underdog flavor. Actually, I think it's one of Ben and Jerry's best flavors ever. Although a very simple ice cream, it's done to perfection and is irresistible. Sometimes less is better. @Stride: I always seem to be one step ahead of you. I already have a review for that one completed and in my backlog. It should be appearing in the near future though! You keep reading my mind! Well, great minds think alike. I can't wait to read your review. My husband and I fell in love with the Cadbury english toffee cream bars,then they disappeared from the stores. Was wondering where we could purchase them from?